Since many religious buildings are unoccupied for more hours than they are occupied, the temperature of vacant spaces is more important than the temperature of occupied spaces. And, most of the unoccupied times are overnight when there is no heat from the sun, lights, appliances and people.Several years ago, we measured the interior temperature of a church for 13 months. In the spring, summer and fall the shell and components of the church endured natural swings in temperature of 27oF. So, the same swing can occur in the winter. So, if your congregation is comfortable at 72oF, for example, then the interior temperature could be lowered to 45oF when it is not occupied, as long as you don’t freeze water in pipes. The unoccupied temperature does not have to be the same all the time. If the outside temperature is 45oF or 50oF, you may not need any heat at all. If your clock thermostat warms the space to 55oF or 60oF on such a day, you could be wasting heat energy. So, you can continually adjust the lower temperature on a clock thermostat to the varying weather conditions outside. When making beautiful music, the organist is more important than the organ. When saving heat energy, thermostat settings are more important than the thermostat. How can you tell what the low temperature actually is? One way is to visit the building very early in the morning – perhaps 2am or 3am. Another is to install maximum/minimum thermometers, particularly in places that are vulnerable to freezing temperatures. In areas that could freeze, you could install freeze-protection thermostats. Such a thermostat might be set at 37oF or 40oF and wired in parallel with the clock thermostat to control the appropriate valve, pump or burner. You probably should cover the thermostat with a locking enclosure to prevent tampering. Older religious building were built when air conditioning had not been invented. In place of air conditioning, many of the older buildings have ingenious natural ventilation systems to remove hot air in the summer. If these are left open by mistake in the winter, they effectively remove large amounts of air your congregation has paid to heat. If you feel a lot of drafty air coming into your worship space, the vents may be open, and should be closed. 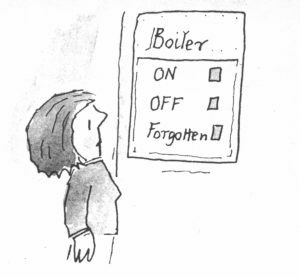 Improving the combustion efficiency of your boiler may save considerable heating costs. The average worship/education building in our database of hundreds of buildings is about 16,800 square feet and uses about 9,000 CCF of gas or 7,000 gallons of fuel oil per year. Even improving it from 79% to 82% could save an easy $300 to $400 per heating season.